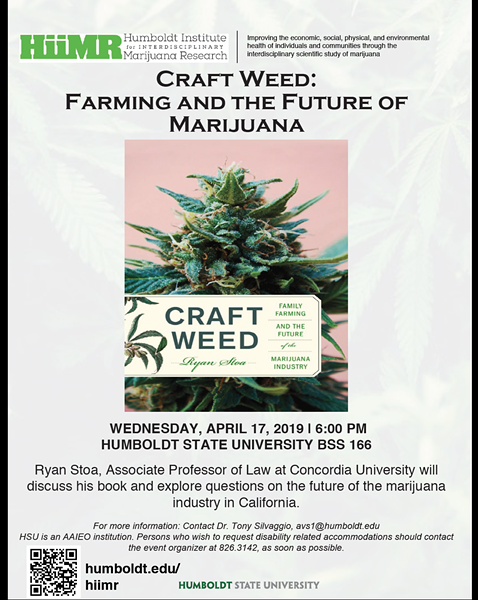 Ryan Stoa, Associate Professor of Law at Concordia University will discuss his book and explore questions on the future of family farming and marijuana industry in California. What will the marijuana industry look like as legalization spreads? Will corporations sweep in and create Big Marijuana, flooding the market with mass-produced weed? Or will marijuana agriculture stay true to its roots in family farming, and reflect a sustainable, local, and artisanal ethic? In Craft Weed, Ryan Stoa argues that the future of the marijuana industry should be powered by small farms—that its model should be more craft beer than Anheuser-Busch.